Packaging company Orora (ASX, ORA) has continued to deliver solid returns for shareholders over the past year, extending a strong record of share price appreciation since its demerger from Amcor. Although there are some challenges, the fundamentals continue to be relatively attractive in our view and the business is well managed. There is scope for margin improvements at the North America businesses and the company has a solid balance sheet providing the financial flexibility to supplement organic growth with acquisitions. 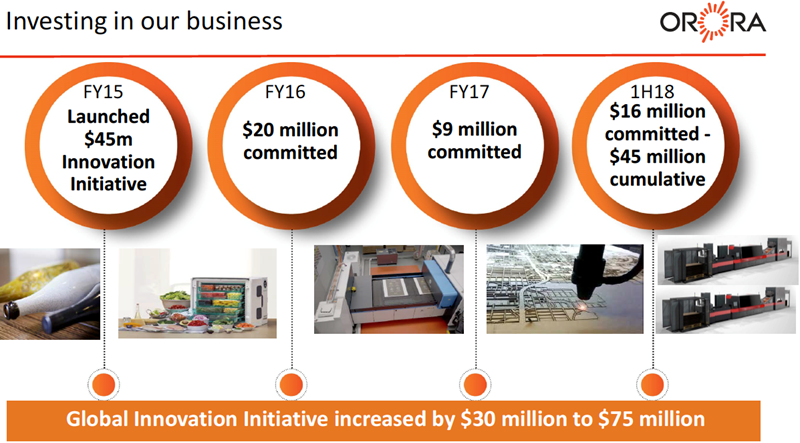 In May 2018 Orora provided a look at its innovation strategy and a brief business update. Orora defines innovation as “the implementation of new ideas that create value for our customers, and our company”. Key goals are to stimulate growth, increase productivity, reduce cost and deliver better products and services. Orora’s approach is focused on machines & technology, its workplace (people & culture) and collaborating with customers. Management highlighted the new EFI Nozumi C18000 single-pass LED inkjet corrugated packaging presses as examples of using cutting edge technology. Orora recently upped its Global Innovation Initiative investment budget by $30 million to $75 million, with $45 million of cumulative investment through to 1H18. In an update on how the North America business has fared to date in the second half and its outlook, Orora said that conditions in North America were like that experienced in the first six months and therefore challenging for growth. Tax reforms in the US are expected to be positive over the medium term. In the Orora Packaging Solutions (OPS) business, the company said that following the success of its Australasian Asset Refresh program, planning is already underway for applying a similar approach with OPS. The potential investment size of the program was pinned at around US$50 million with the funds to be deployed in FY19 and FY20. Orora has spent around $70 million in Australia and New Zealand to refresh and upgrade fibre packaging assets over the past few years and has another $30 million committed to the purpose. A new enterprise software system (SAP) continued to be rolled out across the remaining sites in the OPS business and is on track to be complete by August 2018. The benefits from the rollout of this software system are expected to begin flowing from CY19. The company is now actively looking at more merger and acquisition opportunities for OPS, particularly in the distribution and manufacturing areas. There are some weak spots, with 2H18 results to be impacted by a further doubtful debt provision of US$1.5 million, taking the total impact for the fiscal year to US$2.5 million. Management are estimating that if a major customer doesn’t emerge from liquidation the impact on sales and PBIT (profit before interest and tax) will be approximately US$8 million and US$1.5-2.0 million respectively. Regarding its Australian business environment, the company said moves by China has hit the recycled papers market hard, with a lack of alternative external markets to consume the material in the short term. China’s so-called “National Sword” policy has reduced the import of recycled materials, which is intended to transition the country to a more domestic driven industry and cut down on the waste imported along with the recycled materials. Lower contamination levels for imports into China are in place and being enforced. Additional sorting methods are needed to source new uses for materials. The value of mixed RCP (recycled paper) has fallen sharply and is impacting pricing for other grades as well. 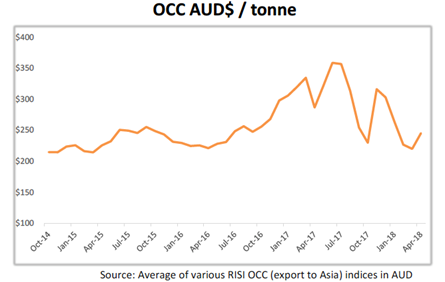 China’s moves have generated considerable volatility in the OCC (old corrugated containers) market, so during the first half of 2018 Orora locked in supply and pricing for around 80% of its OCC requirements. Separately the company inked a new renewable energy agreement effective from May for electricity requirements in NSW and VIC. Combined with existing power purchase agreements (PPA) for renewable energy in South Australia, around 80% of Orora’s domestic electricity requirements are generated from renewable sources. The new PPA is at a fixed price and Orora said its previously forecast annual energy headwind of A$12-16 million will be reduced to approximately A$7 million as it significantly reduces the company’s exposure to volatile electricity prices in NSW and VIC. Orora has generally delivered solid results even amid subdued market conditions through a combination of efficiency gains, business improvement initiatives and acquisitions. Looking ahead, we expect North America and Orora Visual to be key earnings drivers, given the scope for margin improvement, at least over the near-to-medium-term. Orora shares trade on approximately 20 times FY18 earnings estimates, falling to 19 times the following year, with a dividend yield of 3.5% increasing to 3.7% over the same time frame. Interests associated with Fat Prophets declare a holding in Orora.